Learn how to crochet a beautiful farmhouse style jute rug with inexpensive twine from the dollar store and a crochet hook! The floor of our porch looks pretty darn bad right now. I had painted it a few years ago as a quick fix while we decided how we were going to finish it, and that “quick fix” turned into 3 years later… We’re finally going to tile the porch this summer, but until it gets warm enough I had to come up with some sort of more pleasing covering for our Spring porch. 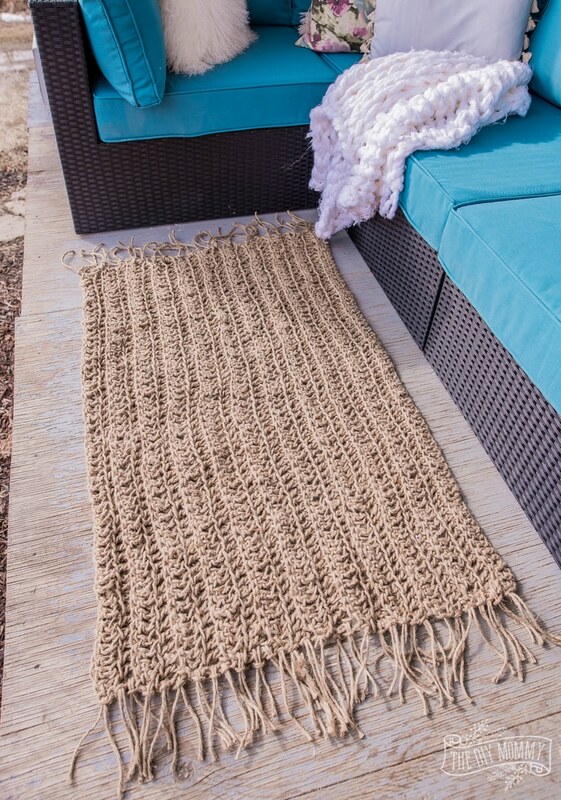 I wanted something rustic and durable, and my first thought was an outdoor jute rug. I love jute rugs for their durability and their farmhouse look, and I thought it would be fun to try to DIY one! A lot of you love dollar store DIY ideas for their afforadability, so I decided to challenge myself to create a rug out of dollar store twine… and I love how this one turned out! This DIY rug covers our beat-up porch floor, and it looks great with our new patio set (which I’ll share with you soon)! Plus, it was a ton of fun to make and it’s a great beginner’s crochet project. All you need to make this DIY jute rug is about 5 rolls of thick dollar store jute rope and a large Q16 crochet hook. Ready to get started? Follow along with my DIY jute rug video tutorial, below! Row 1: Ch 2. Skip 1. *DC into the back of the next chain. * Repeat from * to * until end of row. Row 2: Ch 2. Skip 1. *DC into the front of the next chain. * Repeat from * to * until end of row. 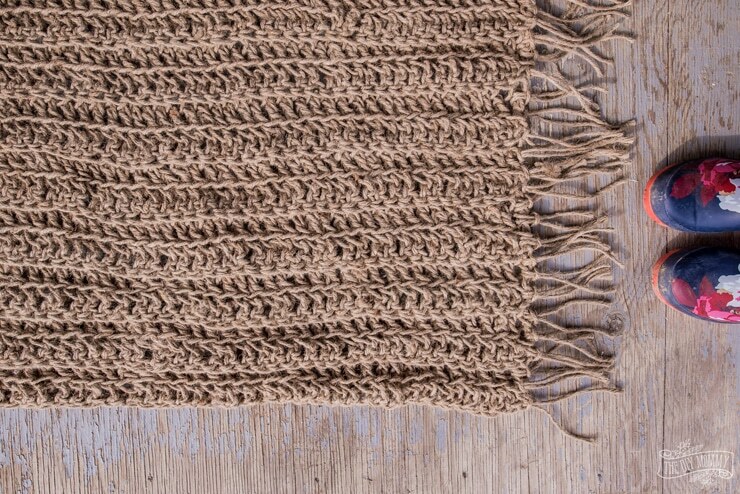 Rows 3 – (However many rows needed to create your rug width): Repeat Row 1 and 2. Finish by trimming rope & pulling end through final loop. 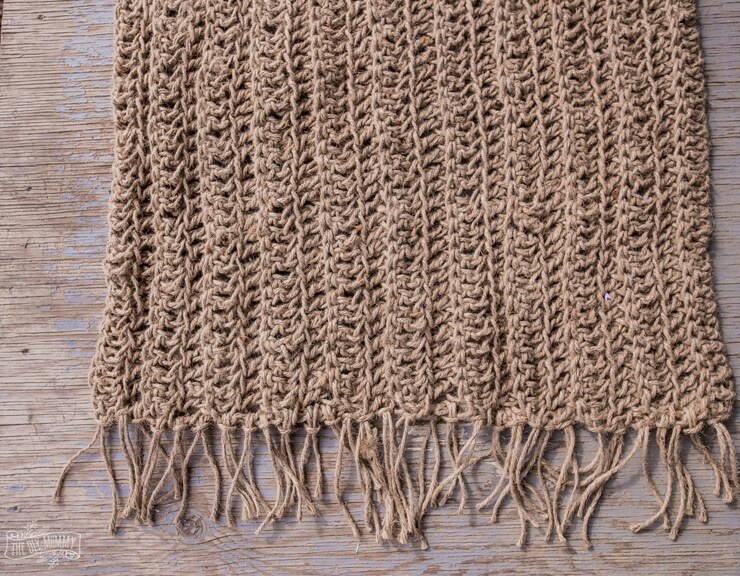 Cut 24+ pieces of jute twine, fold them in half, and pull them through the ends of the rug at even intervals to create a fringe on either end. Need help learning the basics of crochet? 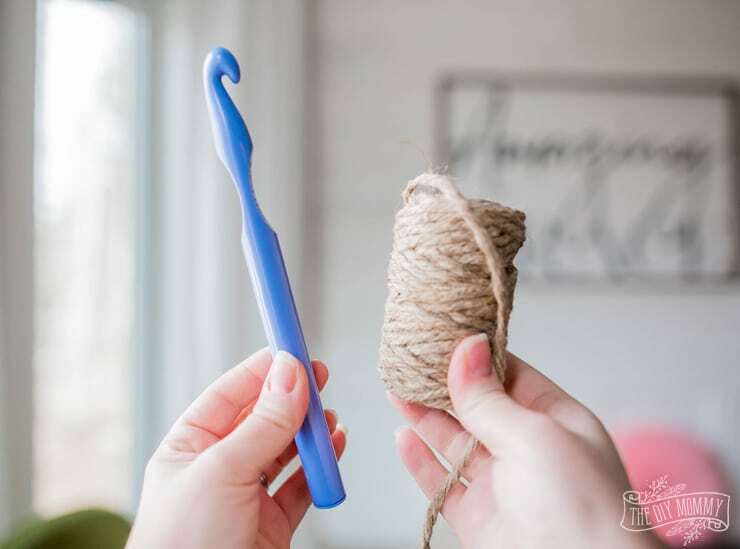 Check out this video & playlist with some crochet tips and basics from Melanie Ham. What a great idea! I need a new outdoor rug, but I didn’t want to pay so much for it. This is perfect! Love you website!! Will try the outdoor rug! Instructions easy and it looks great!!!! You are one creative lady!!!! Wow! I love this!!! I really want to try this!!!! 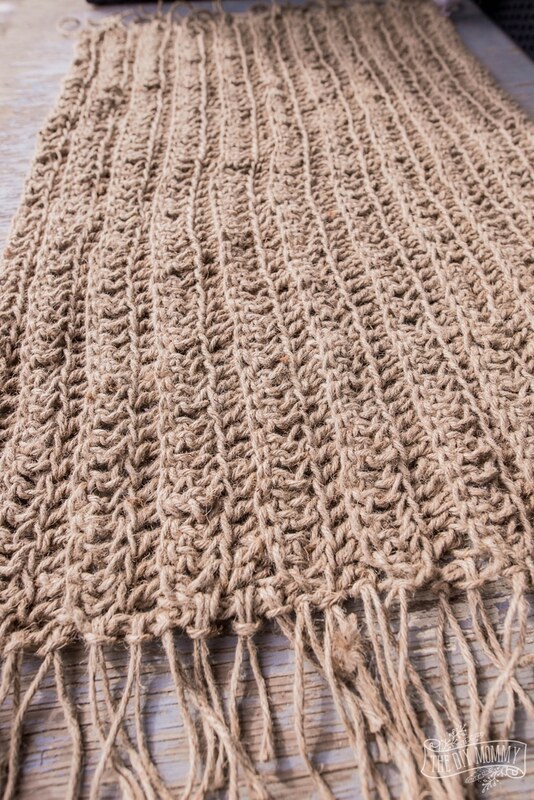 This is a gorgeous rug and using dollar store twine is brilliant. Isn’t It really hard on the hands though, I find even macrame with jute is so rough. Did you wear gloves, or wasn’t it too bad?